Warning: The following post inspired by my recent trip to the Augustiner Museum is extremely long and highly nerdy. Writing it mostly helped me sort out some of my own thoughts, but I think it’s interesting enough to post, too. If you don’t agree, you can go read my thoughts about beer instead. I think I’m developing a new intellectual pursuit. I know, I know, that’s all pretentious and Plan II of me, but it’s true. It’s nothing I’d ever even really thought about before, but now that I’m immersed in it, I’m fascinated. Sacred. Art. Is. So. Cool. I blogged a little bit about some of the art my mom and I got to see when we were in France. But even since then, I’ve just been captivated with all that I’ve seen. Sacred art is really prevalent here in Europe, what with all the old churches and, you know, the Renaissance and stuff. No big deal. 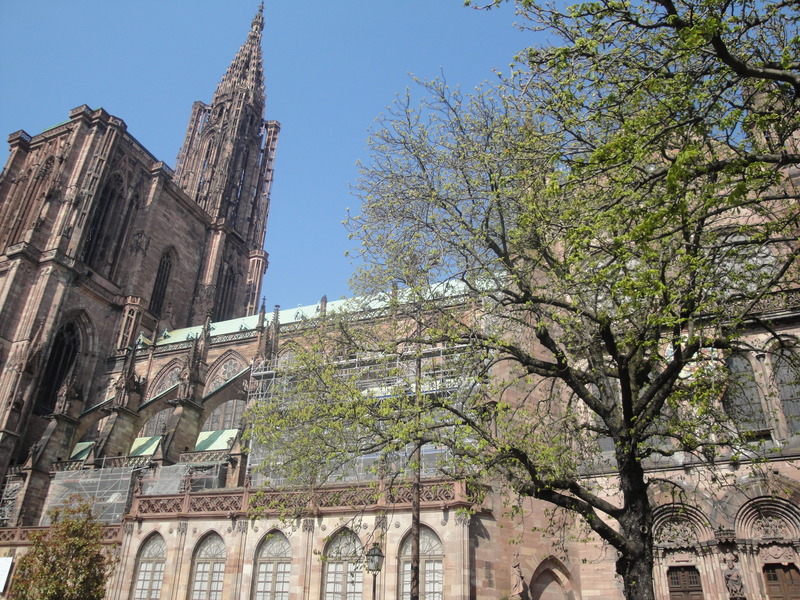 But apparently the Oberrhein, the region of Europe that includes Freiburg and Strasbourg, is a hotbed for statues, altarpieces, paintings, wood carvings, and stained glass windows depicting Jesus, Mary, biblical scenes, and the early saints. In my exploration of the sacred art of the Oberrhein (a journey which, thus far, includes the Unterlinden Museum in Colmar, cathedrals in Strasbourg and Freiburg, and most recently the Augustiner Museum in Freiburg), I’ve discovered how rich and alive my faith’s history and culture really is. The cathedral in Freiburg was easily the biggest church Ive ever seen... crazy. One thing that’s especially fascinated me and made me want to learn more is the style of the portrayals of the early saints. In every church I’ve visited (like, ever visited, even in the US when I was 8 years old), when there are stained glass and statues portraying the saints’ lives, I always look as hard as I can for some indication, some label, of which saint is which. But they’re almost never labeled! It’s so frustrating! But at the Unterlinden, I learned that that’s because there is this extremely detailed network of associations and symbols used to identify portrayals of the saints. For instance, if there is a statue of a female saint holding a lamb, that’s St. Agnes. However, if it is a male figure with a lamb, it’s John the Baptist. Some of them are kind of weird–St. Antony is always accompanied by a pig. I mean, I guess I was aware that this kind of thing existed–I recognize statues of St. Laurence, my home parish’s patron, because he’s always holding a griddle, and St. Lucy, my confirmation saint, because she always holds a platter adorned with her eyeballs (lovely). But I never realized how important it was to the artistic culture or how detailed and all-encompassing it was. It just makes me want to learn every single saint’s story so I can identify all the paintings and statues! Another thing that’s really stuck out is the specific assortment of saints that are frequently pictured. Biblical saints, of course, are very present; the Evangelists, appropriately, and also James the Greater, who for some reason really looks like a pirate. Besides them, though, the big players are the great saints of the early church. Despite choosing one of them as my confirmation patroness, I really don’t know too much about these martyrs and virgins of the first few centuries A.D., so it’s been awesome to learn more about them. The common portrayals I’ve been seeing have been Sts. Laurence, Barbara, Antony, Margaret, Catherine, and Sebastian. For serious, at the Unterlinden I saw so many depictions of St. Sebastian that I really started to wonder what the heck was going on. The only reason I really knew of his story–he was martyred...twice...by being shot with arrows–was because a lot of my male friends chose him as their confirmation saint. He is the patron of sports, after all. It turns out that he’s one of the saints that people really turned to during the Black Plague and so he, logically, became very popular at that time. And then it all made complete sense. I’ve seen him all over the place since then. Now, it’s not surprising at all that a specific time and place in art and culture would have certain trends, certain things that artists especially valued, and certain people to whom they gave honor. But what really strikes me is the simultaneous dynamism and stability of Christian society. 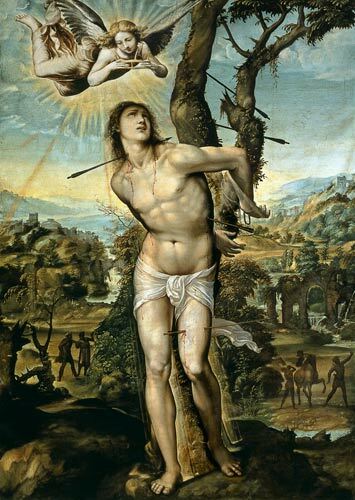 In the middle ages, Catholics in central Europe had really strong devotions to St. Barbara, St. Sebastian, and company… they prayed to them, made art featuring them, probably named their children after them. Even the main guilds of Freiburg each had a patron saint. The tanners, for instance, were especially devoted to St. Agnes. These devotions were so ingrained in European society in that historical moment. But it didn’t stop there. Christian society; European society; heck, human society: they don’t stand still. They’re in constant motion. Which we can see because hundreds of years later, in the 20th century, the same region of Europe was marked with a completely different flavor. Modern Europe, building off of hundreds of years of tradition, produced a new generation of great saints, men and women whose lives were very different from those of the early martyrs. And these saints are some of the ones my generation most identifies with, prays to, and will probably name our children after: Sts. Faustina and Maximilian Kolbe in Poland and St. Therese of Lisieux in France, to name a few. Despite the obvious differences between today’s society and the Middle Ages’, there is still a need to connect to people, especially those who inspire us, those who are great. And we build and strengthen those connections in a lot of the same ways. Ever seen a picture of St. Therese that didn’t include a rose? Modern saint identification. And how did St. Faustina communicate her message to the world? Largely through the Divine Mercy image. Modern sacred art!